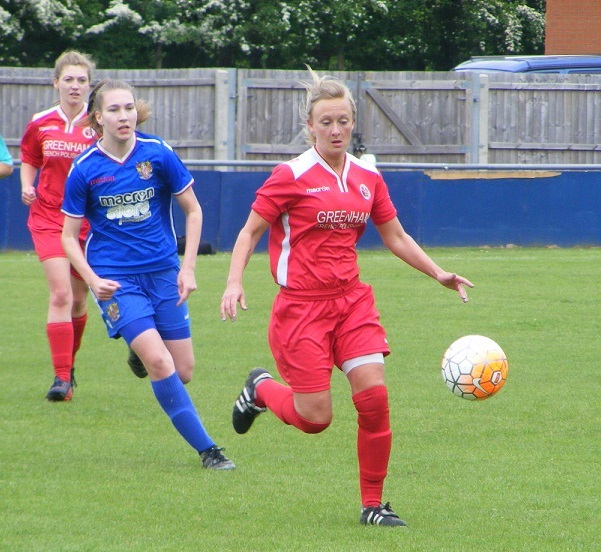 Another double bill of Cup Finals this Sunday from The County Ground in Letchworth from the Eastern Region Women’s Football League (ERWFL) this time around. The League Cup to come but first up it’s an 11:00am kick-off between Hutton Ladies & Stevenage Ladies Reserves for the League Plate Final. 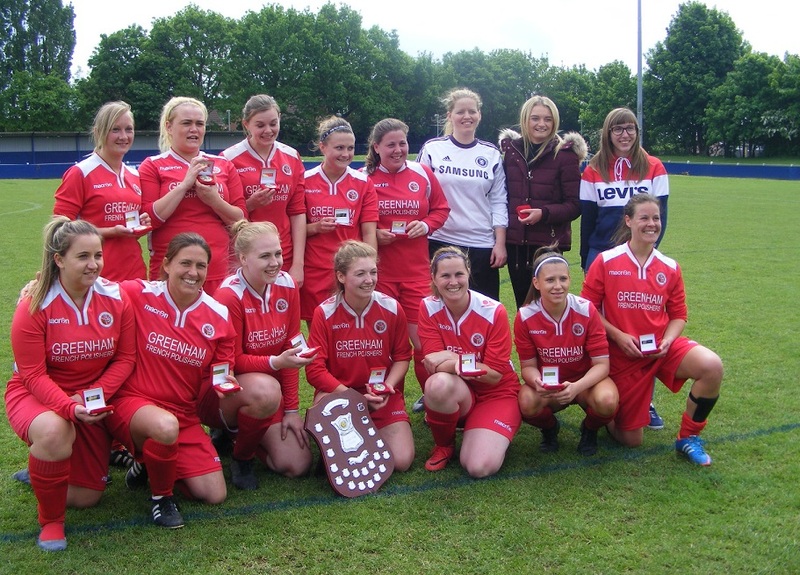 Hutton Ladies the current holders of the ERWFL Plate after a 1-0 win over Colney Heath Ladies last season. Were the underdogs then and once again they will be seen as the underdogs as they take on fellow league Stevenage Ladies Reserves who having won the ERWFL Division One South title are looking to complete the double. Hutton Ladies with one more league game to play finishing fourth in the ERWFL Division One South table. Have already claimed silverware this season lifting the Essex Women’s Trophy with a 2-1 win against Silver End United Ladies. A tough challenge against Stevenage Ladies Reserves in this season’s Plate Final but can use last season’s result as inspiration and the knowledge they were the side to eventually bring an end to the league champion’s 100% winning start to the season. Stevenage Ladies Reserves have led the ERWFL Division One South table from start to finish winning their opening 10 games not conceding a single goal in that period either. 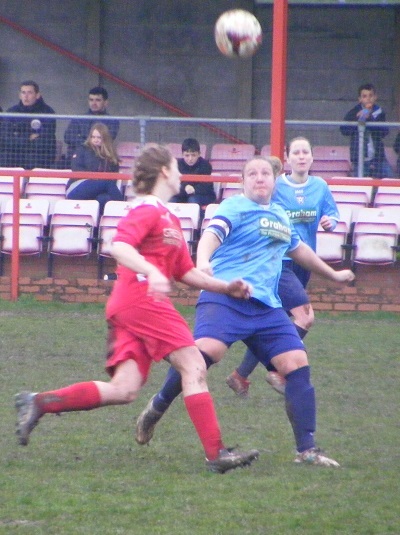 Both records broken in February by today’s opponents Hutton Ladies in a 3-2 win. Stevenage Ladies Reserves have conceded just 9 goals in total from 18 league games this season whilst scoring 81 up the other end. Clinching the league title with 4 games to spare are looking to end the season with the double. The nature of the Plate, the sides knocked out of the League Cup in the opening rounds entering the competition. The Division One sides in from the North & South contesting the early Rounds of the League Cup. Both sides receiving a bye in the 1st Round of the Plate. 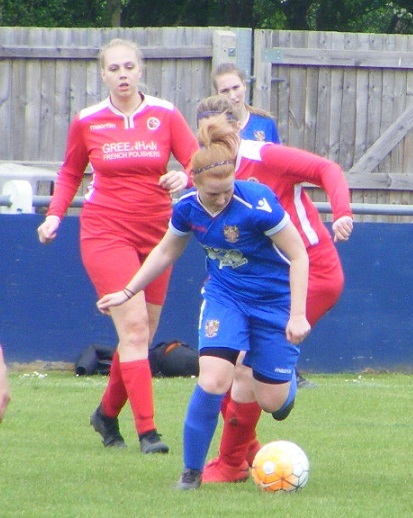 Into the quarter finals Hutton Ladies were away to Division One North side, Cambridge United WFC Reserves, the game all square at 90 minutes the sides drawing 2-2 it was Hutton who went on to score the winning goal in extra-time. Stevenage Ladies Reserves drawn at home to fellow Division One South side, Little Thurrock Dynamos Ladies progressed to the last 4 of the Plate with a 3-0 victory. Into the semi-finals and contrasting games for both sides Hutton Ladies at home were taken all the way to extra-time once again after a high scoring game with Division One North side, Histon Ladies 3-3 after the 90 minutes was up into the extra period Hutton getting themselves in front went on to add a 2nd goal to reach their 2nd successive final with a 5-3 win. 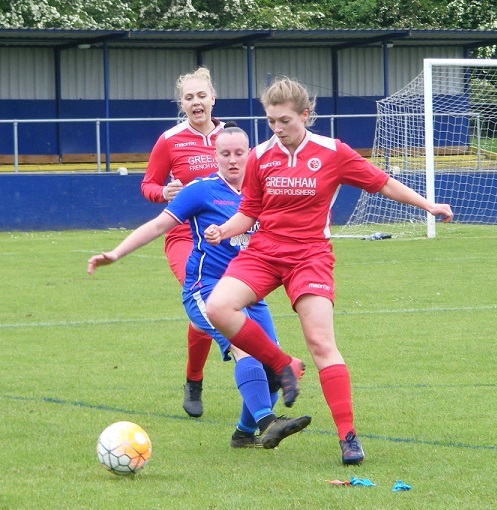 Stevenage Ladies Reserves were at home in the semi-finals against fellow league side Hoddesdon Town Owls Ladies and booked their place in the Plate Final with another 3-0 result. The County Ground, Letchworth home of the Hertfordshire FA the venue once again for this season’s ERWFL Finals. The main seated stand housing the clubhouse and bar the changing rooms beyond. A nice wide pitch looking in very good condition with plenty of grass cover. The weather good, warm with the sun trying to get out cloud cover for the morning kick-off for the 1st of today’s matches. Hutton Ladies starting XI – Krissie Glover, Nicola Walker, Rianne Dimmock, Hannah Page (C), Kelly Roberts, Amy Crumpler, Kaitlin Sugg, Keeley Walker, Lucy Critchell, Kate Lowen & Laura Allen. Subs – Patrizia Leo & Lucy Blurton. 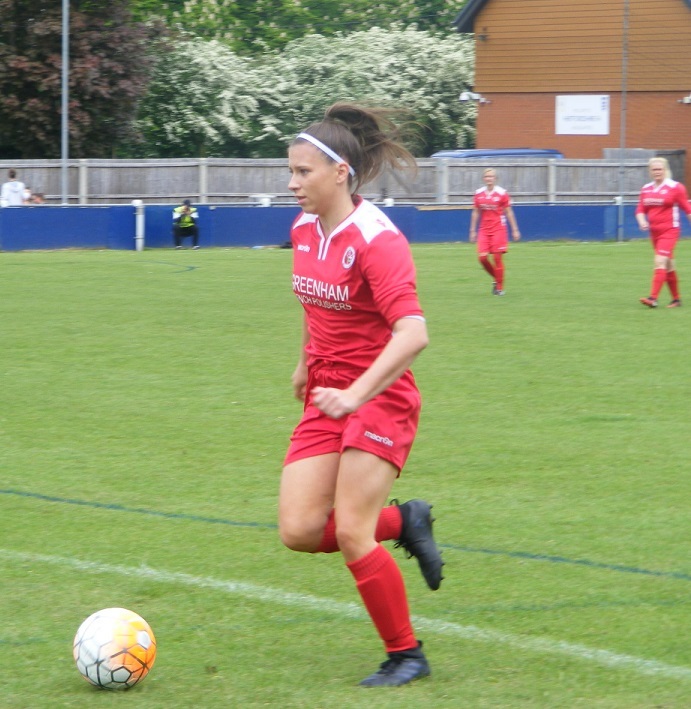 Stevenage Ladies Reserves starting XI – Emily Goodacre, Holly Darling, Amy Notschild, Laura Henning, Stacey McConville, Becky Day, Sherrie Evans (C), Hayley Wood-Thompson, Hannah Marshall, Daniela Martucci & Emily Schofield. 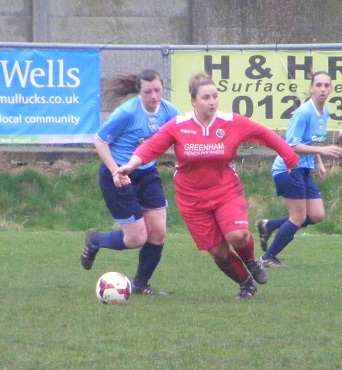 Subs – Naomi Sleator, Rebecca Brooker, Mary Lisle, Stef Cowell & Izzy McAree. It’s Stevenage to get the ERWFL Plate Final underway kicking off 1st half wearing an all blue kit with red and white piping around the collar and sleeves of the shirts. Hutton kitted out in their all red kit with white across the shoulders of the shirts. Becky Day playing the all out into the right channel for Daniela Martucci to chase the Hutton defence can see it safely out for an early goalkick. Stevenage make progress down the left, Hutton goalkeeper Krissie Glover coming out of her area to kick the ball clear see’s striker Laura Allen after it to attack the Stevenage area, Amy Notschild across the get in front of her and clear the ball for a throw. The ball pressed early on cut out at the back. Allen and Kate Lowen try to link up through the centre to attack the Stevenage defence the attempted one two cut out Notschild. The first corner of the game awarded to Stevenage, Hayley Wood-Thompson to play the ball into the box the ball half cleared Emily Schofield on the right hooks it back in towards go, Martucci closing in on it near post, Glover has it safe on her gloves first. Holly Darling slides in to deny Hutton’s Critchell as Crumpler plays the through ball to her on the left. Stevenage counter attack breaking forwards Hutton back tracking conceding a corner on the left side Schofield to play it in Kelly Roberts with the stooping header near post defends for Hutton. The ball coming onto Wood-Thompson just outside the box left of the D, goes to strike the ball her effort charged down. Lowen and Allen are looking to combine once again through the middle for Hutton as Kaitlin Sugg plays the ball forwards, Notschild getting in between them to break up the attack. Lucy Critchell finding room to run into on the left lifts a cross into the area, Stacey McConville clearing for Stevenage a rapid counter is launched the ball played on to Wood-Thompson coming away with the ball left side looks to put Hannah Marshall in behind on the opposite flank send the diagonal ball crossfield, Nicola Walker defending well for Hutton Ladies at left back. Working hard early on to break up Stevenage’s flow, Hutton are gaining encouragement from their play. Bringing the ball on over half way Sugg send the ball forwards releasing Lowen through on goal as she bursts in behind the Stevenage defence, right of goal into the box, takes an extra touch, enough to allow goalkeeper Emily Goodacre coming towards her to slide in and save at the strikers feet. Stevenage press players forwards Schofield moving out to the right to gather the ball, Hutton captain Hannah Page gets across to challenge the striker 20 yards from goal. Roberts intercepting inside the box as Wood-Thompson looks to run in on goal from the left as a high ball from the right is fired into the Hutton area. Stevenage haven’t settled Hutton are lively looking to close down everywhere on the pitch. A free-kick awarded to Hutton 35 yards out left of the centre circle players go forwards as Lowen plays the ball in long towards the far post, Sugg getting up highest sends her header into the back of the net Hutton celebrate thinking they have taken the lead, but no the flag is raised for offside it doesn’t stand. Another free-kick to Hutton same position only right of the centre circle this time Amy Crumpler to deliver this time long to the far post again headed down back across the six yard box, Rianne Dimmock there for Hutton but no opportunity to shoot as she is quickly closed down and Stevenage scramble the ball away. Martucci spinning off her marker in the middle releases the ball into Schofield’s run on the left, sends a cross long the top of the six yard box, no one gambling for Stevenage. Hutton get it clear. A chance created for Stevenage on their left as Wood-Thompson goes to charge down a defensive clearance the ball spinning into the D, Page looking to control under pressure from Schofield the ball prodded into the area with Marshall coming onto it her shot straight at Glover the keeper making the save. Hutton are battling for everything frustrating Stevenage in the process. Riding their luck at times Dimmock slicing her clearance the ball spinning favourably into the box for Glover to grab. Goodacre with an excellent save to deny Hutton from another set-piece similar to the earlier one on the left a little closer this time Crumpler goes for goal the ball arrowing in high on target central Goodacre throwing herself at the ball punches it over the crossbar. All action the ball from one end to the other Dimmock sending a shot wide from a corner at the near post for Hutton. Laura Henning charging a Hutton ball down in half way brings in on fires a pass into Martucci back to goal inside the D she spins off her marker sending the ball on into the box Wood-Thompson arriving can’t quite bring it down on her chest to set up a shot the ball running wide. Hutton make a change, Walker coming off Patrizia Leo coming on the move seeing Critchell dropping deeper. A free-kick wide right for Stevenage the ball played in towards the top of the box Martucci with a clever flick to send the ball on into the area, no one there however Glover can claim unchallenged. Keeley Walker snapping at the ball in midfield wins it from Day plays it on for Lowen right side she plays it on into the area near post Allen closing her down Goodacre stays composed claims the ball. Glover with a top class save at the other end to deny Schofield the ball played into the striker on with the ball she arrives at the top of the area Glover coming to close her down Schofield looks to prod the ball wide of her, almost succeeds Glover however manages somehow to get her foot in the way of the ball and deflect it away for a corner. Stevenage bring the ball on possession on the right brings a corner kick the ball played into six yard box Sugg heading away for Hutton, out of the area Day with the looping header back in Martucci interested, Glover comes punching the ball away from the strikers head. Hutton get the ball forwards Walker on for Lowen a one tow with Allen the ball sent on for Lowen to chase right side McConville goes with her concedes the corner. A late opportunity in the first half for Stevenage to take the lead, awarded a free-kick in a dangerous position left of centre Martucci with the right foot strike a superb effort the ball swerving as it flies in on target bring a magnificent save from Glover falling back as she throws her hand towards the ball the merest of touches diverting it onto the crossbar, rebounding back into play Hutton scramble away for the corner. Coming in from the right Glover is fouled as she comes for the ball right on the stroke of half-time. Goalless at the break one side with a goal disallowed the other striking the bar a really interesting contest and proof that the form book can go out the window in a cup final. Stevenage haven’t really settled yet into any rhythm, frustrated, Hutton have worked well right across their side to pressure the ball and break up attacks have created opportunities themselves as they have been encouraged by their performance. Defending well at the back Glover with a couple of crucial saves. Stevenage know they can play better and will no doubt look to come out strong in the 2nd half. Hutton if they can duplicate what they have achieved in the 2nd half will be hard to break down. Hutton kicking off the 2nd half start confidently Critchell bringing the ball on from the left looks to take the ball infield is tackled by Notschild. Stevenage build on the right the ball fed on for Schofield turns inside towards the goal into the area her shot in towards the near post not troubling Glover. Walker with good work in the midfield for Hutton gets her pass on for Lowen right side holds it up before turning her marker and sending in a cross long towards the far post just out of Allen’s reach. Stevenage get froward on the left Schofield moving into the channel has the ball squares it inside to Evans 30 yards out central time to line up a strike pulls the effort wide of the left post. Schofield is covering alot for ground up top getting into good crossing positions for Stevenage, the final ball more often than not collected by Glover. Critchell is yellow carded as she tugs back Wood-Thompson trying to get inside her from the right. The free-kick from a wide position sent over the bar. Stevenage make a change Darling coming off to be replaced by Izzy McAree. Martucci with an opportunity to play the ball in towards goal from a set-piece left of goal 30 yards out as Hutton with away a free-kick, her strike wide at the near post. Day come on with the ball for Stevenage on for Marshall has Schofield on her left giving her the ball she is tackled by Dimmock as she charges at the Hutton defence. Hutton’s Walker intercepts a cross from the left from Marshall getting back as Evans breaks forwards through the middle. GOAL! Seemingly out of nothing the deadlock is broken and it’s Hutton who take the lead the ball brought on though the middle Hutton have players forwards lined up across the top of the Stevenage penalty area the ball is played into Lowen inside the D she flicks the ball on sending it looping up high into the area, dropping towards goal Goodacre back on her line tries to palm it out from under her crossbar her glove caught in the net can’t get to it as it drops past her into the goal, Hutton take the lead, everyone converges on Lowen in celebration so I had to check afterwards to be sure it was her 1-0. A valuable lead for Hutton. Stevenage look for a quick reply Day bringing the ball on the pass out to Martucci, Page coming across defending well for Hutton. Henning winning the ball as she moves forwards for Stevenage is allowed to travel with the ball has a pop at goal from distance her strike straight at Glover positioned central in the Hutton goal. Stevenage attack Evans getting the ball out to Schofield moving clear on the right a run at the Hutton defence cuts back inside getting into the box sends a fierce cross along the six yard box Martucci arriving far post meeting it sends the ball over the Hutton crossbar. Marshall attacks on the left for Stevenage runs into too many bodies as Hutton close the gap in front of her. The ball cleared is picked up by Henning and fired back in Martucci with the shot puts the ball straight at Glover the keeper with a comfortable save. Hutton make a change Crumpler coming off on comes Lucy Blurton. Hutton continue to work hard to break up the play, Page and Roberts both getting to the ball first as Stevenage play it forwards for Martucci and Marshall to chase down. Lowen receiving the ball as she breaks into the right channel looks to knock it past McAree, the Stevenage defender putting in the challenge to win the ball. Marshall left side fires a cross infield into Martucci position top corner of the Hutton box, shows great control to bring the ball down and swivel into the shot like so many others before it however the ball is straight into Glover positioned at her near post taking it low into her body. Hutton build an attack Walker on for Lowen central inside her is Allen playing the ball into her Walker has run on into the box Allen picking her out no shot on lays the ball back to Leo 25 yards out curls her shot up over the crossbar. Leo with another shot at goal moments later as Hutton attack with Lowen on the right squared across the top of the area with Walker central helped onto Leo she fires her strike up over the bar from the edge of the box. Leo with a 3rd effort in quick succession as Allen and Lowen work the ball forwards Lowen attempting to get on the end of Allen pass into the box favours Leo left of goal blasts the ball straight at Goodacre a great blocking save at close range the ball lose Stevenage get it clear of their box. Allen with a dipping volley from outside the box as the ball is put into her from a throw on the left her effort caught easily by Goodacre. Glover with another fine save to deny Day as she hits the ball back in towards goal after Schofield’s initial shot from the right. Roberts with the near post header defends for Hutton from a Stevenage corner from the left. Stevenage with the change Day the player coming off Stef Cowell coming on with around 10 minutes left on the clock. McConville bringing the ball on for Stevenage inside to Martucci, she plays it on for Schofield her touch taking her inside a run at the box is brought down inside the D by Dimmock. A free-kick awarded Schofield has picked up an injury. Stevenage make the change before the free-kick Schofield helped off on comes Mary Lisle. The set-piece just a foot outside the box. Martucci on it, a good effort gets the ball up over the wall but also narrowly over the crossbar too. Wood-Thompson is off for Stevenage with 5 minutes left to play Naomi Sleator coming on. Lowen finding room with the ball on the right cuts inside along the top of the box moving across the D gets a shot away back across goal wide of the post. Into the closing minutes of the match Hutton get a corner left side played in Evans puts it out near post for a 2nd corner this time Hutton try to hold it up in the corner. Stevenage regain possession fire the ball up to Martucci tries to turn inside run at the Hutton defence Page close on her winning the ball back. McConville with a late strike from distance is straight down Glover’s throat the keeper dropping down onto the ball. That’s it the final whistle blows and Hutton Ladies celebrate a 1-0 win to win the ERWFL Plate Final for the 2nd successive season. An impressive performance from Hutton Ladies don’t think they even believed they could do it at the start of the match but just like last season they overcame the odds to win the trophy. Encouraged early on pressing the ball well and defending strongly gained the belief that they could get something going forwards themselves. The winning goal coming in the 2nd half, Hutton looked comfortable afterwards with the narrow advantage. Stevenage created chances and got players forwards just didn’t get the luck of the green today. Glover in the way of anything they threw at her. Miss out on the double and will no doubt feel disappointed but must remember they have dominated the league this season and are the League Champions. Three trophys in two season’s for Hutton Ladies not a bad return at all. There were several contenders for the Women’s Football East – Player of the Match in today’s final and I knew my notes were going to have to help me out on this one. It was a strong all round team performance from Hutton in today’s Plate Final. The defence superb, Dimmock, Page and Crumpler. Walker impressed in midfield. The last line of any defence is the goalkeeper however and for Hutton Krissie Glover was behind everything Stevenage put into her box made a number of crucial saves too during the game and she is the ERWFL Plate Final’s Player of the Match. Congratulations to Hutton Ladies on winning today’s ERWFL Plate Final. If that was the starter I can’t wait for the main course. Was a really entertaining final Hutton proving lightening can strike twice. My thanks to both teams for their help with the team line-ups. A little time to relax before the ERWFL League Cup Final kicks off. 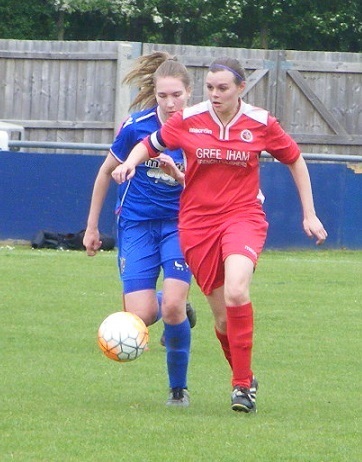 This entry was posted in Cup Final, ERWFL League Plate, Match Reports and tagged Cup Final, ERWFL League Plate, Hutton Ladies, Match Report, Stevenage Ladies Reserves on May 14, 2018 by WFEast. Saffron Walden Town FC the venue for today’s football action on Women’s Football East, another Cup Final this season’s Essex Women’s Trophy Final to be contested between Hutton Ladies and Silver End United Ladies. A new format for the competition this season with the sides knocked out of the earlier rounds off the County Cup going on to contest for the Trophy. Today’s final between two sides that play there football in the Eastern Region Women’s Football League (ERWFL) Division One. The pair haven’t met in league action as geography see’s Silver End United Ladies play in the North section with Hutton Ladies in the South. For a 2nd successive season Hutton Ladies reach a cup final, having reached the ERWFL Plate Final last season beating Colney Heath Ladies to life the trophy. 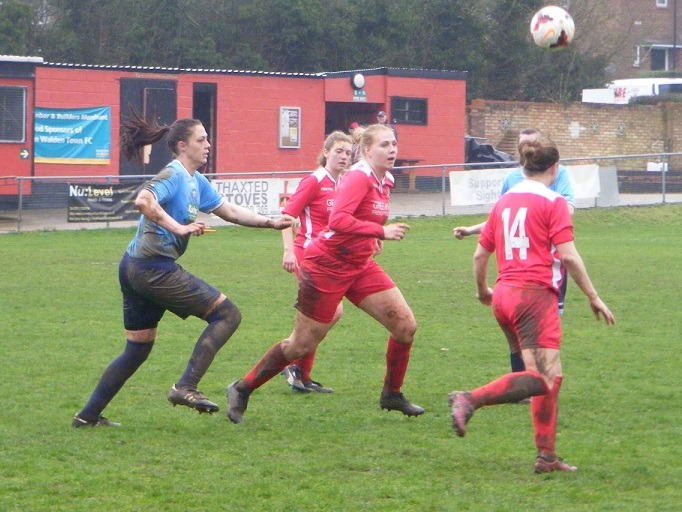 Reaching the Essex Women’s Trophy Final this time around are still in with a good chance of defending the ERWFL Plate too having reached the last four, that semi-final scheduled for next weekend at home to Histon Ladies. Struggled for numbers at the beginning of the season which eventually led to their Reserve side folding earlier in the season. Currently 4th in the league are like many sides in the region, have several games left to play following one of the wettest winters in recent season’s aswell as their run in the cups. 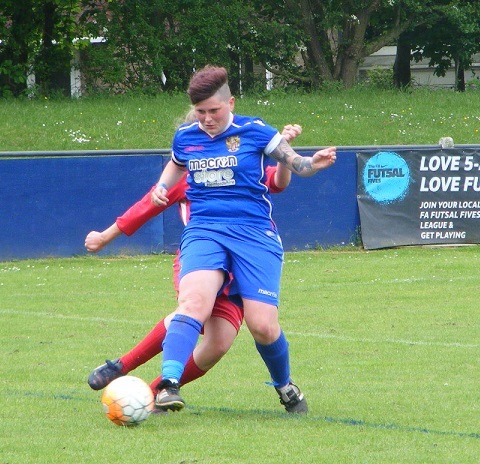 Silver End United Ladies are one of the few sides who have played out there fixtures ending their league campaign last weekend today’s final is their last match competitive match of the season. Have had a difficult campaign in the league finishing bottom of the league having struggled for numbers and injuries at the start of the season. 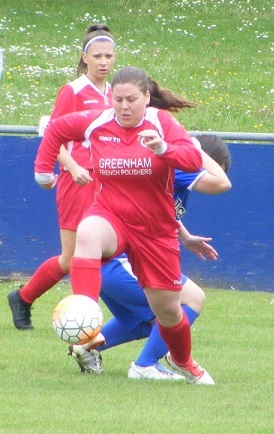 Danielle Warnes taking on the role of player-manager at the start of the season. Rebuilding and recruitment during the season recent form has improved and to reach the final of a competition at the end of their season is a fantastic achievement. 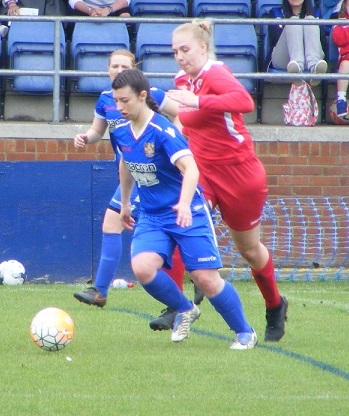 Both sides entering the Trophy in the first round were both up against young sides riding high in their 1st season’s in women’s football amongst the title chasers in Essex Women’s Division One. Hutton Ladies were away to Leigh Ramblers Ladies coming out on top in a close match winning 3-2 to reach the quarter finals. 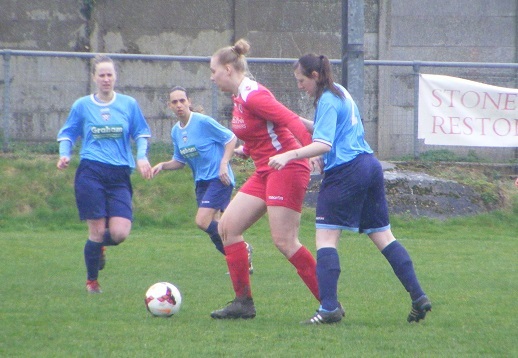 Silver End United Ladies were at home to Southend United Ladies a 2-0 victory seeing them into the last 8. 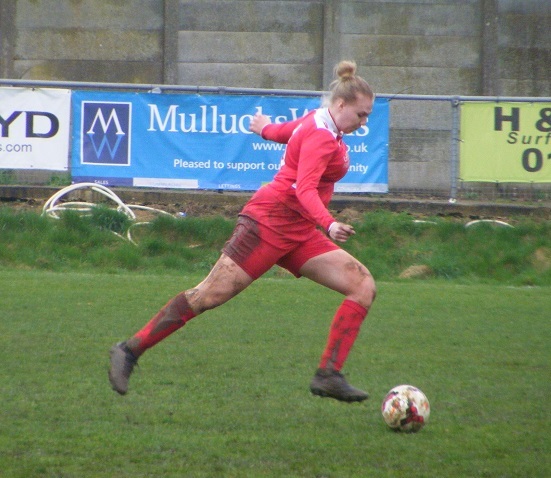 Hutton Ladies were away in the quarter finals taking on Essex Women’s Premier Division side Collier Row Tigers a 2-1 win seeing them book their place in the last 4. Silver End United Ladies were handed an away win against Hutton Ladies Reserves side who have since folded. 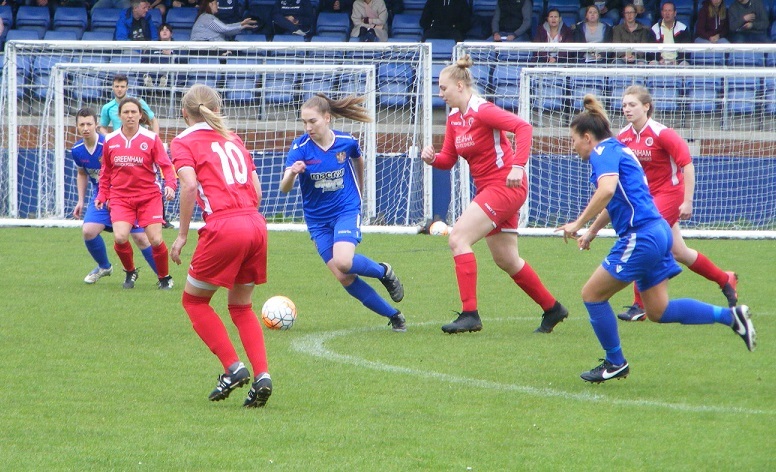 Hutton Ladies had a home draw in the semi-finals up against Essex Women’s Division One side Rayleigh Town Ladies another new name this season. A free scoring side, Hutton proved to strong the higher league placed side comfortably into the final with a 6-1 win. 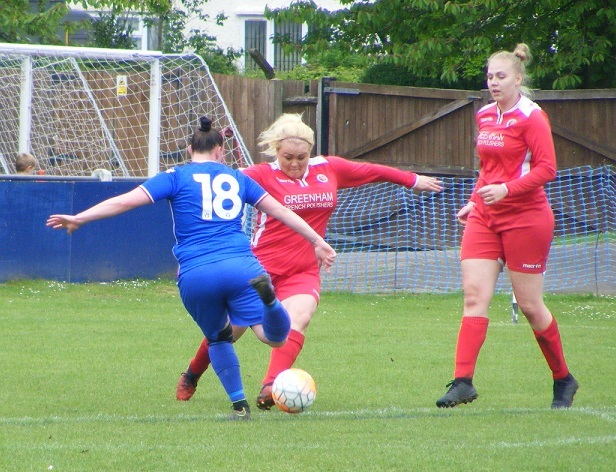 A closer looking game in paper for Silver End United Ladies in the semi-finals at home to the current holders of the play Essex Premier Division side, Frontiers Ladies. Silver End United Ladies started the better and leading 2-0 at half-time held off a Frontiers come back in the 2nd half to win the match 2-1 the reach the Trophy final. The venue for today’s game Saffron Walden Town FC a small stadium in the heart of the town, car parking available beside the ground. two small seated stands either side of the pitch. A large bar and clubhouse with rejoining kitchen serving hot food and drinks. Sadly the weather wasn’t playing ball this Sunday as again like so many others recently the day was overcast with heavy rain falling before the game. It rained all the way down from Norfolk so I wouldn’t have been surprised if the game was in doubt when I got there, but despite being muddy the pitch drains well and was okay for the final. Hutton Ladies starting XI – Krissie Glover, Nicola Walker, Kristi McLeavey, Hannah Page (C), Rianne Dimmock, Kaitlin Sugg, Amy Crumpler, Keeley Walker, Lucy Critchell, Kate Lowen & Laura Allen. Subs – Rhiannon Mallard-McHugh, Lucy Blurton, Hayley Critchell & Patrizia Leo. Silver End United Ladies starting XI – Hannah Streetley, Emily Bambrick, Roxanne Gardner (C), Lindsey Cowell, Danielle Warnes, Danielle Bragg, Stephanie A’Len, Juliana Marques, Rebecca Donnelly, Megan Jiggins & Georgia Bryan. 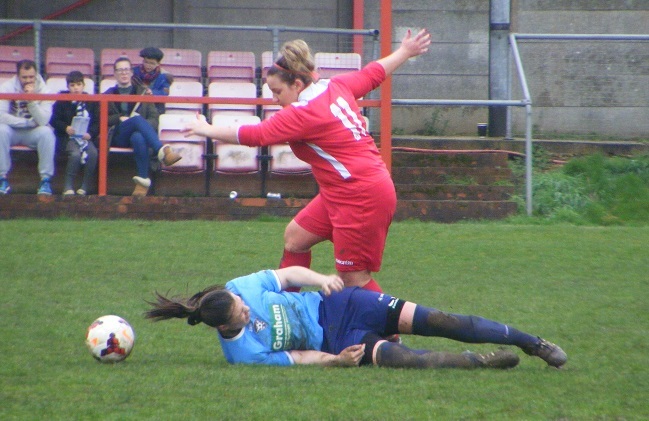 Subs – Laura Borein, Toni Brown, Jennifer Stanhope, Lisa Nepean & Angela Holden. The rain still falling as the teams walk out onto the pitch the presentations taking place it’s Silver End wearing light blue shirts with navy shorts and socks to kick-off the 1st half with Hutton lined up opposite in an all red kit with white across their shirt shoulders.Conditions are going to be slippery under foot with the amount of rain that has fallen the ground having already seen one final played today. Hutton win the ball early play it long out to Lucy Critchell breaking down the left wing, Silver End captain Roxanne Gardner at right back sliding in to make the challenge put the ball out for a throw. Kristi McLeavey winning the ball for Hutton looks to play Kate Lowen in ahead of her on the right taking the ball on down the line slips as she attempts to turn inside giving Emily Bambrick the opportunity to tackle and put the ball out for a throw deep on the right. McLeavey throws it long towards the edge of the Silver End area, Lindsey Cowell getting her head on the ball to clear for Silver End, they counter attack getting the ball up to their attackers, Megan Jiggins bringing the ball down passes it to Georgia Bryan to her left looking for the return pass put into her path as she looks to get in between the Hutton centre backs, Hannah Page, Hutton’s captain intercepts the pass. A free kick awarded wide on the right for Silver End a chance to put the ball into the area a good delivery into the six yard box Hutton goalkeeper Krissie Glover does well under with a Silver End player closing her down to punch the ball away, the play halted the challenge deemed unfair against the goalkeeper, Glover takes the free-kick. McLeavey with another long throw in deep inside the Hutton half in the right the ball knocked on across the top of the area Lowen knocks it over the top with Laura Allen breaking in behind, the ball dropping wide of goal before she can get a telling touch. Hutton have started the game the better pushing players forwards turning play around quickly no one is afforded any time on the ball the pass forwards Allen giving chase Danielle Warnes sliding in to win the ball. Silver End attack up the right Juliana Marques with the ball squared inside players clustering round the top of the area Jiggins with the strike in towards goal, Glover right behind it makes the comfortable save. Silver End capitalise as a kick out of the area from Glover is intercepted on the right side the ball moved quickly into the middle Jiggins turning and sliding the ball on for Rebecca Donnelly 25 yards out the goal open hits the ball 1st time Glover scrambling to get back across arrives just in time to see the ball bounce wide of the post. A busy opening quarter hour play rushed as both sides move the ball on quickly, Silver End are on the attack, the ball won back by Keeley Walker in her own half the midfielder carries the ball forwards Allen making a good run ahead of her peeling away to the right receives the ball shooting from just outside the area her shot angling in towards goal is straight at Hannah Streetley the goalkeeper making the save. Gardner defends well up against Allen in the next Hutton attack as Walker looks to set her up moving left this time. Silver End break forwards players drifting into the middle, Donnelly is in space on the left the ball played forwards she gives chase towards the box, Glover comes rushing out to meet her sliding in to save at the attackers feet, the ball not gathered runs on behind Glover, Donnelly keeping her feet tries to get there McLeavey back on the cover shielding the ball as Glover gets back to smother the ball. Kaitlin Sugg with good hold up play moving towards the right for Hutton get the ball forwards for Allen running in behind, a cry of frustration as she sends her cross behind the Silver End goal. Up the other end Rianne Dimmock comes across from the middle of defence to put the ball out for a throw as Donnelly is looking to get in behind for Silver End on the left. Warns puts in the block as Lowen and Allen attempt the one two getting forwards down the right channel for Hutton. Streetley with a good save to deny Allen as Hutton push on down the left the diagonal ball missed by the Silver End defence running onto Allen clear into the box pulls the trigger looking to put the shot back across the keeper Streetley getting a glove on the ball to deflect it away. Hutton look lively breaking forwards through the middle Walker on for Lowen takes a run at the Silver End defence, Bambrick blocking her shot the rebound coming out to Amy Crumpler she attempts the slide the through ball on for Allen, a little too much on the ball Streetley can get out of her goal to gather at the top of her area. GOAL! Approaching the half hour mark the dead lock is broken as Hutton score the opening goal of the final, pressing forwards through the middle Sugg on the ball riding a tackle from Jiggins as appeals are made for the free-kick Sugg finds herself with time and space on the ball 35 yards out takes on the shot her lobbed effort flying over Streetley to land in the back of the net 1-0. Crumpler bringing the ball on through the middle after breaking up at Silver End attack looks to exploit a high defensive line a defensive slip seeing Allen run in behind the flag up against Hutton as Lowen is caught offside. Both sides make a change, Toni Brown coming on for Bambrick for Silver End, Hayley Critchell on for Lucy Critchell for Hutton. Stephanie A’Len bringing the ball on for Silver End through the middle support to her right with Marques the ball dinked over the top of the Hutton defence deflected wide brings the 1st corner of the match. Played in from the right a good delivery an equally good claim from Glover jumping at her near post. A’Len getting on with the ball at her feet again through the middle has Donnelly breaking clear on the left wing taking the ball on up the line squares a cross in towards the near post Jiggins closing in as Glover goes down to save the ball put wide looks to come off the keeper but a goal kick is awarded. Into the closing minutes of the 1st half a throw deep on the right for Silver End the ball played into the area Bryan holding in the ball up right of the goal attempts to lay it back for the advancing runner, Hutton defend the ball deflected wide across the six yard box Jiggins retrieves left side swings a low cross back into the six yard box, Glover down low lays claim to the ball. Last attack of the half as Hutton break the ball rolled on for Lowen to take on jinking left then right takes on the Silver End defence moving right gets a shot away from inside the box, Streetley is a tall goalkeeper plucks the ball down safely at her near post. That 1st half passed very quickly the ball wasn’t still for a second both sides eager to get forwards, play broken up in midfield space is available if the pass can find the runner. Both goalkeepers producing saves. A single goal the difference between the sides a narrow advantage for Hutton a well taken goal by Sugg to put them ahead. Silver End far from out of the game plenty to look forwards to in the 2nd half. A change for both sides at half-time. Both in attack, Patrizia Leo is on for Hutton in place of Lowen. Angela Holden is on for Silver End in place of Bryan. Hutton to get the 2nd half underway. Silver End win the ball and counter the pass long out to Donnelly on the left wins a corner kick. Players forwards as the delivery comes in from the left knocked on across the face of goal falls to Holden from close range her shot is blocked deflected behind for a corner on the right. A good ball in low across the top of the six yard box, no one challenging Glover as she drops forwards onto the ball. Bragg with a excellent tackle to get hold of the ball for Silver End in the centre on for A’Len she runs with the ball before looking to slide Jiggins in on goal Sugg tracking back is able to shield the ball back to her goalkeeper. A free-kick on halfway for Hutton players up to the top of the area as Crumpler plays it forwards the headed clearance coming back to her as she advances takes a shot fro distance her effort blocked Sugg trying to get on the end of the rebound Silver End launch the ball up field. Crumpler plays the ball on for Critchell getting clear on the left closing in on the byline sends a low cross in towards the six yard box Streetley gets to it first. A’Len with the ball on for Jiggins she is tackled by Walker, the game becoming a little stretched, Silver End knowing they are not out of it sense they can pull the scores level Hutton know they need another goal. Critchell sees another cross in from the left race across the Silver End six yard box. Walker does enough to stop A’Len as the Silver End midfielder looks to press on with the ball. The ball not cleared the diagonal ball is fired in towards the far post Marques closing in, Glover gets out ahead of her to take the ball. Leo on the attack right side fires and early ball into the area a difficult ball for Streetley to deal with gets a glancing touch on the ball in the middle of her six yard box to knock the ball on to the left side Critchell after it regains possession hitting a shot in on the turn, Streetley has her near post covered by then is well placed to make the save. Silver End launch a rapid counter the ball on through the middle Bragg on for Jiggins on the move takes on the early shot outside the area Glover behind it all the way safely gathers. Straight up the other end the ball played out to Critchell on the left side knocks the ball inside 25 yards out sends a shot in towards goal the rising ball heading for the top corner Streetley makes the save knocking the ball down and away for the corner. The corner delivered low in towards the near post is cleared. Silver End make another change Marques the player coming off on comes Jennifer Stanhope. Silver End are pushing fro the equaliser with 20 minutes of the game left Leo attacking with the ball right side turns in field is tackled by Brown on the edge of the box. Hutton make another change the Critchell’s switching places once again Lucy back on for Hayley. GOAL! Crumpler has the ball at her feet running towards the Silver End goal his fouled by Bragg in a dangerous position 25 yards out central to goal. It’s Crumpler to take the set-piece strikes it superbly the ball curled over the wall finding the top right hand corner of the goal to double Hutton’s lead with less than a quarter of an hour to play 2-0. Crumpler involved in the build up once more as Hutton push on taking the ball on through the middle lays the pass out to Leo on the right her early diagonal ball low into the box evades Streetley the ball heading for the goal beyond the Silver End defence back tracking the ball is cleared off the line by Warnes. A throw high on the left for Hutton into Critchell plays the pass from the top of the area 25 yards out on for Allen she takes the ball on shapes too shoot her standing foot going out from under her as she doe so the ball running wide of the far post as a result. A free-kick for Silver End as Gardner is fouled inside her own half almost all go forwards towards the Hutton penalty area. Hutton make a change Crumpler coming off, Lucy Blurton comes on. GOAL! Closing in on the final 5 minutes of the match and Silver End set up a tense finish to the final as they pull a goal back. The ball played up towards the top left corner of the area Hutton don’t get it clear as Silver End pressure the ball the cross is fired into the middle of the area, A’Len meeting it sends the ball past the keeper into the back of the goal to make it 2-1. Jiggins plays the ball on for Donnelly looking to come inside to attack the box from the left Dimmock gets there first to clear the ball over her own crossbar for the corner. Allen finds space on the left as the ball is won in midfield by Walker. Shoots from 25 yards out her low ball in gathered by Streetley. Silver End make another substitution Bragg the player coming off, Lisa Nepean on. 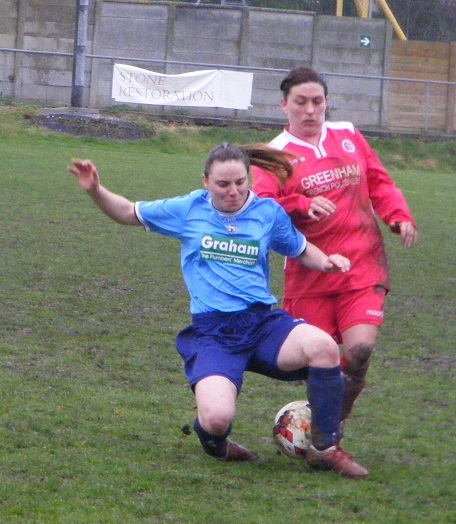 Nicola Walker gets forwards on the left in support of Allen the attacker getting the ball into her the full back squares a cross into the area intercepted by Warnes. Allen chases the ball into the corner eating up valuable seconds. 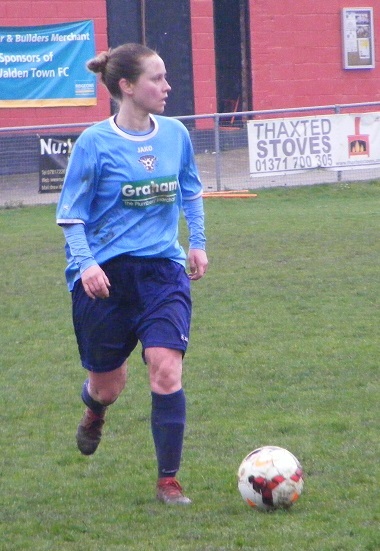 Silver End bring off Gardner late on sending Laura Borein on a straight swap at right back. Donnelly sends a shot over the Hutton cross bar after the referee plays the advantage as she runs onto the ball after Jiggins is fouled in the middle. 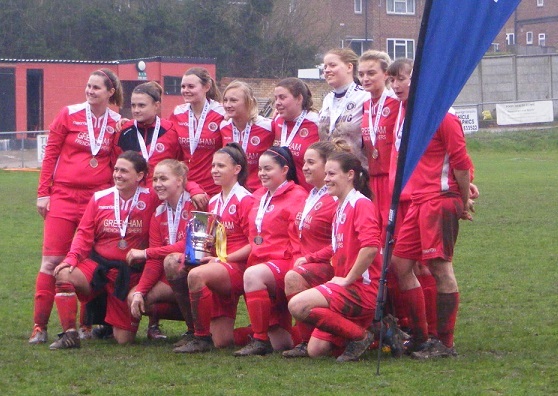 The last chance of the match as the final whistle blows and Hutton Ladies celebrate winning the Essex Women’s Trophy. Despite the horrible conditions an entertaining final played at a furious pace both sides never finding any time on the ball. Hutton leading 1-0 at half time were in need of a 2nd goal as Silver End pushed for a reply in the 2nd half, Amy Crumpler’s superb free-kick doubling the advantage. Silver End never gave up though and pulling it back to 2-1 made Hutton work for the result. Sometimes it can be an easy decision… but more often then not it’s a tough one picked a Women’s Football East – Player of the Match. A committed battle in the centre of the park play broken up by both sides, plenty of good forwards movement too. One player slightly ahead of the rest and consistent throughout was Hutton’s Amy Crumpler and add on to that her excellent free-kick the make it 2-0 she wins today’s Player of the Match award. Congratulations to Hutton Ladies on winning this season’s Essex Women’s Trophy Final. To Silver End United Ladies congratulations too, a cup final to end a difficult season for the club. Plenty more games left to squeeze in before the end of the season and possibly some dry ones too. 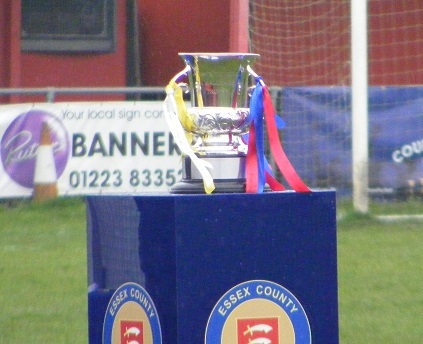 Enjoyed the final despite the weather my thanks to the Essex FA and both the clubs for their assistance today. 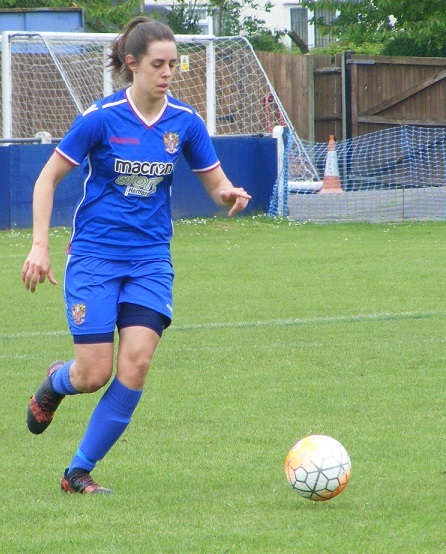 This entry was posted in Cup Final, Essex Women's Trophy, Match Reports and tagged Cup Final, Essex Women's Trophy, Hutton Ladies, Match Report, Silver End United Ladies on April 9, 2018 by WFEast. The midweek football action continued on the Supporting Women’s Football Blog with a Friday night fixture popping up on the calendar, another trip to Essex this time to the John Hornby School in Basildon to watch the ERWFL Division One game between Hutton Ladies & Little Thurrock Dynamos Ladies. Friday night football on the Supporting Women’s Football Blog another trip down into Essex to watch more women’s football from the ERWFL, this time in Division One with Hutton Ladies playing Little Thurrock Dynamos Ladies. Hutton Ladies are the home side for tonight’s fixture usually play their home fixtures at the Basildon Sports Club a short distance away. Are an established side in the Eastern Region Women’s Football League set-up. Were among the title chasers last season in the old ERWFL Division One West, one of the few sides in the ERWFL I’ve yet to see play. Also have a Reserves side competing in the Essex Women’s Premier Division. 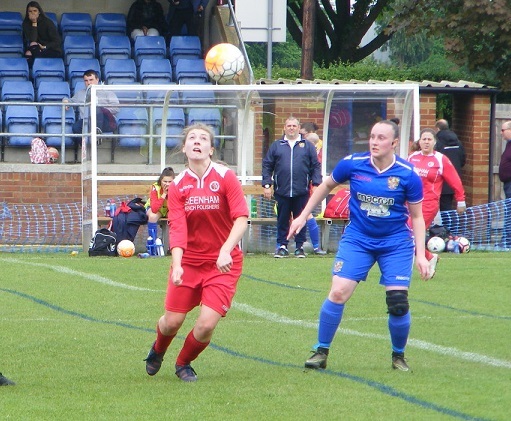 Little Thurrock Dynamos Ladies are late to the season didn’t start their league campaign until this Sunday earn’t a point scoring with the final kick of the ball at home to newly promoted Wymondham Town Ladies in a 3-3 draw. Aren’t running a Reserves side this season, the club however has a large squad to pick from. Are looking push on this season challenge for promotion to the ERWFL Premier Division. A rearranged fixture from the start of the season with both sides having players unavailable, partying at the V festival. A Friday night kick-off the easiest way to secure a 3G pitch with floodlighting. The venue for tonight’s game the John Hornby School in Basildon, I have been here before only I hadn’t remembered because it was during a hurricane for my 1st match of 2016 when only 4 fixtures survived the weather got soaked through watching Billericay Town Ladies v Acle United Ladies. Is a decent sized 3G pitch with room for supporters to stand beside safely beside it. The weather much improved dry the evening still humid but cooling. 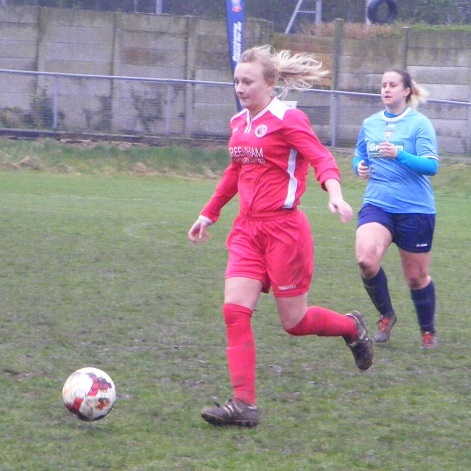 Hutton Ladies starting XI – Krissie Glover, Danielle Jennings, Rianne Dimmock, Kelly Roberts (C), Hannah Page, Rhiannon Mallard-McHugh, Jessica Tuffen, Laura Allen, Amy Crumpler, Hayley Critchell & Danielle Cliffe. 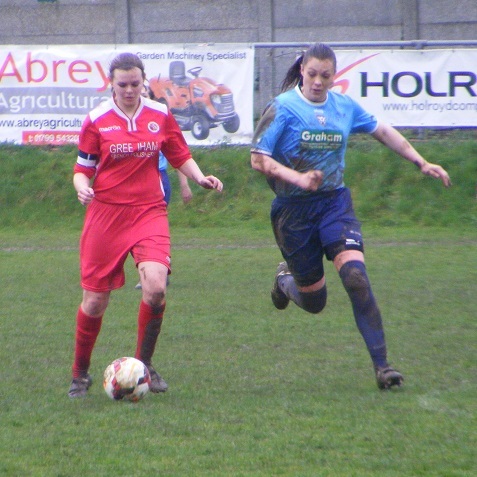 subs – Kaitlin Sugg & Keeley Walker. Little Thurrock Dynamos Ladies starting XI – Jasmine Brooker, Courtney Fraser, Eloise Ives, Danielle Styles, Taylor Parrish, Abbie Simmonds (C), Kerri Thomas, Robyn Mudd, Libby Clarke, Georgia Fraser & Sophie Dowman. The floodlights starting to come on it’s Little Thurrock to kick-off the 1st half, wearing black and orange shirts, black shorts and socks with Hutton lined up opposite in an all red kit with white collar and trim on the shirts. The ball is sent long out towards the left wing early on, Hutton get possession and look to try the same up the other end of the pitch. An energetic start from both sides the ball is exchanged between the sides without the precision needed to pick anyone out. Krissie Glover keeping goal for Hutton is quick to react get out to the edge of her box as Little Thurrock captain, Abbie Simmonds in the centre of midfield plays the ball in behind the defence for Sophie Dowman to chase, the keeper getting hold of the ball launching a counter move the ball into Rianne Dimmock on the left played down the line for Hayley Critchell tries to knock it past the Little Thurrock defence get down the wing, Taylor Parrish from centre back comes to tackle put the ball out for a throw. Neither side is letting the other have time on the ball, closing down in midfield, Laura Allen for Hutton turn cleverly evade a challenge, brings the ball on into the Little Thurrock half threads the ball between the opposition defence, goalkeeper Jasmine Glover is out to the top of her area to gather before Danielle Cliffe can reach it in attack for Hutton. Cliffe back to goal 25 yards out holds the ball up pushing it back to Amy Crumpler coming forwards to support her, has Critchell to her left looking to make a run in behind the Little Thurrock defence, tries to play her in over the top, the pass too straight is easily gathered by Brooker. GOAL! Little Thurrock push forwards win a corner on the right, players coming up from the back gathering at the far post area. Is a fantastic delivery into the box flashed with pace across the six yard box, straight at Danielle Styles hits the ball on the volley a sweet strike to send the ball back across the goal face and over the line 0-1. Plenty of zip and bounce on the artificial playing surface, Little Thurrock using the width Robyn Mudd attacking up the left wing driving on with the ball keeping Hutton right back Danielle Jennings busy. On the left side attacking for Hutton, Critchell is constantly looking to play the ball around the full back run in behind, but Parrish is always there to get across and tackle beyond. Hutton have a throw deep in the Little Thurrock half, Crumpler puts the ball into Cliffe standing outside the top left corner of the box rolls it into the path of the advancing Dimmock who looks to curl her cross into the area, too close to the keeper who catches it near post. Little Thurrock have settled into the game quicker than Hutton closing the ball down better, the back four dropping back as a unit the midfield squeezing the ball forcing Hutton to play it backwards rather than forwards. Kelly Roberts, Hutton’s captain makes a vital interception at the back cutting out a Simmonds diagonal pass that would have seen Georgia Fraser clear to run in behind. 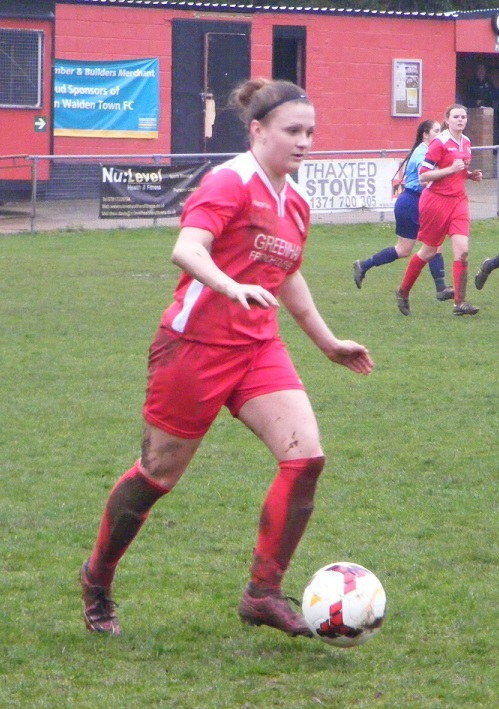 When Hutton do go forwards Crumpler has space in the midfield as Little Thurrock drop off her, keeping tabs with those breaking forwards limiting the passing options. Crumpler very nearly threads the ball through the eye of the needle as Critchell tries cutting back inside through the centre Parrish just manages to get a toe on the ball to push it away from her. Getting up the left wing for Little Thurrock, Mudd gets her side a throw in, players push up the line the ball thrown long into the crowd, Dowman spins off the back knocking the ball on into the area gives chase, Hannah Page coming the other way gets to it 1st launching it out of the area for Hutton. Change for Hutton Rhiannon Mallard-McHugh comes off with Keeley Walker coming on. Little Thurrock make a substitution too, Katy Rudd on for Dowman. Hutton are awarded a free kick in a dangerous position a couple of yards outside the box on the left side indirect, Tuffen shifts it for Crumpler her strike is charged down by Simmonds the ball spins away to the right, Critchell puts her foot through it right of the D, the shot screws away from goal. Kerri Thomas is high up the pitch on the left side as Mudd driving forwards with the ball gets another throw in send long again Thomas receives turns inside and shoots from the top corner of the box, aiming near post Glover is behind it all the way makes the save. Thomas does well for Little Thurrock in the middle controlling the ball with her head before knocking it out to Eloise Ives on the right, she sends a long diagonal ball up towards the top of the area for Fraser, has Roberts with her the defender out muscling her headers the ball back to her keeper. Critchell pressing up the left forces Little Thurrock to concede the corner kick. Players come forward from the back taken from the left goes long, Roberts is under it can’t get her head on the ball, Little Thurrock clear it, Allen picks it up for Hutton 30 yards out hitting the shot on the half volley, is off target. Little Thurrock bring on Patrizia Leo in place of Ives. A corner late in the 1st half for Little Thurrock on the left the ball is fizzed into the area with pace Simmonds with the header places the ball over the crossbar. A narrow lead for Little Thurrock at half-time, in a 1st half that has seen little goal mouth action. Scoring from a set-piece have done well as a unit to frustrate Hutton and close the ball limit their attacks. A narrow lead Hutton have come forwards well enough but been a little slow in their build up play allowing Little Thurrock plenty of time to get organised cut out the final ball. It’s Hutton to kick-off the 2nd half. Hutton play the ball up into the right channel win a corner straight away in the 2nd half, the ball into the box is cleared by Courtney Fraser as Little Thurrock launch a rapid counter attack the final ball hit with too much pace for Judd to get to is gathered by Glover inside the Hutton box. Judd involved in the next Little Thurrock attack the ball sent into the box from the right by Simmonds, Judd bursting into that side of goal sees the ball drop over hr shoulder, but trying to hep it goal wards does get a good connection with the ball runs on for Glover to scoop up. Roberts is down in her area with a muscle injury, needs to come off to recover, Kaitlin Sugg comes on. Mudd and Judd link up well on the left side, the former winning a corner off Jennings. Another good delivery fired into the area with pace behind it, too close to the keeper this time, Glover with a confident claim. Hutton’s frustration grows are a little static Cliffe goes down injured as she and Simmonds tussle for the ball in the middle of the park an ankle injury can’t continue, is carried off, Roberts recovered from her knock ready to return to the action. Little Thurrock bring off Mudd send on Sophie Darkins. Hutton have alot of players up the pitch for a throw on the left, the ball is won back by Little Thurrock who attack quickly the ball given to Simmonds on half-way carries it on into the Hutton half Judd sprints forwards to her right wanting the ball played into the area, Simmonds tries the diagonal ball, Page in between the pair well positioned to intercept. Simmonds is seeing alot of the ball 2nd half for Little Thurrock bringing it on down the right is brought down the referee playing the advantage as Courtney Fraser latches onto the loose ball takes it in behind the Hutton defence, lifts the cross into the box Glover coming towards the ball gets a firm hold of the ball at hr near post. Judd is flagged offside for Little Thurrock as Darkins attempts the ball through the middle of the Hutton defence. Critchell hasn’t stopped running on the left for Hutton, has found it tough to get in behind the Little Thurrock defence the throws conceded are adding up, from one of those the ball is dropped into the feet of Hutton’s Sugg shifts it and spinning inside drives towards the area before blasting a shot on the angle into the side netting. GOAL! Little Thurrock double their advantage keeping up their pressing game the ball is won inside the Hutton half, Simmonds races forwards through the middle looking to support Judd as the attacker finds an extra burst of energy to get her clear of Page at the back, reaching the top of the area holds it up as the keeper starts to come Page gets back too, The ball popping out from the pair just as Simmonds arrives her touch taking it beyond everyone and into the back of the net 0-2. Glover comes out sliding in to save the ball at the feet of Judd as she breaks into the area from the right one more played in by Darkins. The corner deliveries from Little Thurrock have been excellent something they have been working hard at in training recently. Have a corner the ball in from the left is along the six yard box met by Parrish who heads it back across goal, Hutton have players marking the posts the ball is headed clear back into the box, after a scramble a 2nd corner is conceded, swung in too close to the keeper this time Glover calls for it and claims. Simmonds latches onto a goal kick takes a stride with the ball then unleashes a shot right of the goal 30 yards along the ground Glover a little off guard, flicks out a boot to gets something on the ball deflects it wide across her area conceding the corner. GOAL! Little Thurrock are on top at this point in the 2nd half creating chance extend their lead to 3 with another well taken corner, fired in long again dissecting the six yard box it’s Styles up from the back who stoops to send a bullet of a header into the back of the net 0-3. Little Thurrock rotate their players making plenty of changes, Naomi Hayes coming on for Thomas. Dowman comes on for Simmonds. Critchell taking the ball up the left for Hutton, turns inside finding a half yard for a shot fires the ball in towards goal on target, Brooker is behind it palms the ball down and collects. Little Thurrock are awarded a free-kick inside the Hutton half 35 yards from goal, Georgia Fraser never-the-less takes on the shot places her effort over the bar. Ives returns the the field for Little Thurrock Fraser rested. A mistake at the back from Brooker handling the ball outside her box gives Hutton an indirect free-kick right on the edge of the area, left side the ball is shifted for Crumpler to blast goal-wards powers the ball wide across the face of goal. GOAL! Not long after Hutton do pull a goal back from a dead ball, have players up around the Little Thurrock area the ball is knocked into the box the referee spots a hand ball and points to the spot. Dimmock to take the penalty, sends the ball into the back lifting the ball to the keepers right 1-3. A little under 10 minutes plus stoppage to play. The goal has floored Hutton have 2 players down injured both including goalkeeper Glover are OK to continue little time left to play in the game into a lengthy period of injury time, Little Thurrock continue to press forwards the ball comes into the feet of Ives in space in a central position outside the box puts her foot through the ball powering it goalwards, Dimmock is pole-axed briefly as she drops to block the shot with her head deflecting it away for the corner. The set-piece is cleared the referee blowing the final whistle. A 4-1 win for Little Thurrock, fully deserved put in a good performance full of energy, closing the ball down well and defensively solid keeping a good shape at the back. A real threat from set-pieces some quality balls from dead ball situations, pick up their 1st win of the season to move onto 4 points and join the chasing pack behind leaders Cambridge City Ladies. The opposite for Hutton a lack-lustre performance never really got going and heads dropped too early 2nd half. Showed some promising build up play the final ball needed to be put in quicker too often Little Thurrock were allowed to get back into position. Stay on 4 points in the chasing pack too, early days yet in the season..
My thanks to both clubs for their help with the sides tonight, appreciated as always. 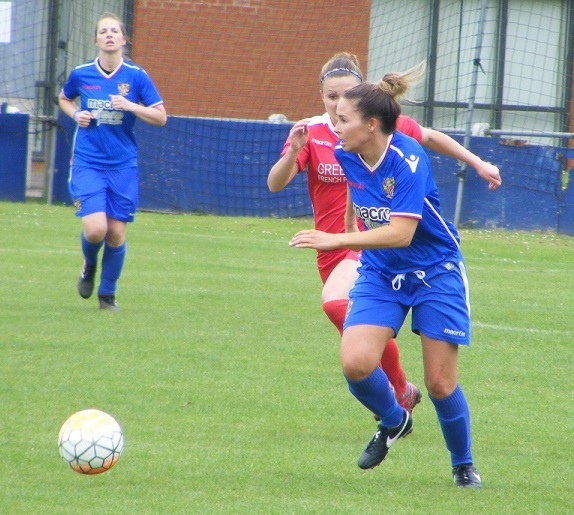 This entry was posted in ERWFL Division One, Match Reports, SWF Blog and tagged ERWFL Division One, Hutton Ladies, Little Thurrock Dynamos Ladies, Match Report on September 10, 2016 by WFEast.